This is Christine. 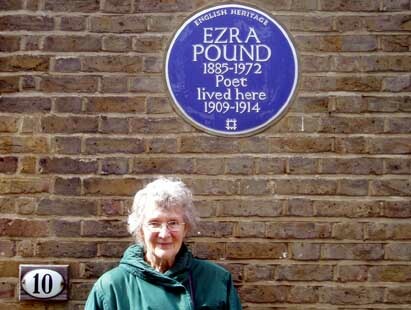 She lives in Ezra Pound’s house. Well, it wasn’t his house exactly but he did live there for five years, on the first floor, according to Christine. She happened to be popping down to the shops at the time I was photographing her house and asked if I was a Pound fan. I don’t care much about biography, particularly when it comes to “understanding” or learning more about writers or composers I’m interested in. It’s always the work I want to find out more about, not how the person who made it was living at the time. The one exception I’ve made is for Ezra Pound, my favourite poet. Yes, I know he was a mad, fascist anti-Semite, but he’s also a revolutionary, beautiful and fascinating writer (although some of that fascination comes from the writing’s frequent difficulty and wildly variable quality), and just about everyone writing over the past century has been influenced by him to some extent, whether they like it or not. I was compelled to read Pound biographies because appreciating his work becomes inextricable from understanding his political and economic opinions, bizarre and repugnant as they often are. Untangling the issues of what he did or did not do, and how and why he did them, becomes essential when arguing with people who think he’s an unintelligible Nazi loony. I remembered from one biography that Pound spent many of his years in London at 10 Kensington Church Walk, hanging out with an esoteric bunch: T.S. Eliot, Wyndham Lewis, Hilda Doolittle, Rabindranath Tagore, Henri Gaudier-Brzeska, Ford Madox Ford, Robert Frost, and D.H. Lawrence (the last sleeping on his floor from time to time). One sunny afternoon I went over to Kensington to find the spot. 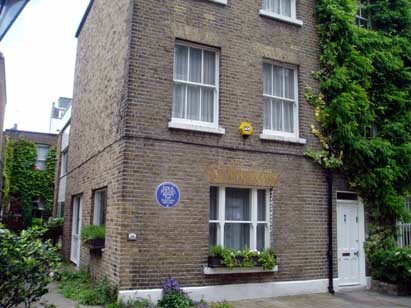 This has been made easier because just last year a blue plaque was unveiled to commemorate his residence. The lingering controversy about him can be seen in the amount of time it took to get this official recognition – English Heritage has refused previous applications. During his life and for the 33 years since, Pound has had the additional unfortunate tendency to be a crank magnet, so I was worried the plaque may be defaced or surrounded by graffiti about social credit. But no, just a quiet courtyard off a quiet walk behind the church (whose bells Pound complained about to the vicar, in an angry letter written in Latin). Christine very kindly postponed her shopping to invite me in for a cup of tea and to look through the photographs of the unveiling ceremony. She said she had people stopping by every now and then, and were no bother: she rather enjoyed the attention. The committee from English Heritage gave her a bouquet, in case you’re wondering what’s in it for you if your house scores a plaque. We then turned to photographs of her cat, and her family living in the USA and Sydney. Now I’ll have to get hold of a copy of Julian Rios’ novel Poundemonium, and go on a homage to a homage. If you want to know what I’ve been reading, Humphrey Carpenter’s A Serious Character is the most detailed and dispassionate Pound biography currently available. The other books commonly found suffer from being written while Pound was alive and the author having an axe to grind, for or against the subject. Even Carpenter’s book is badly flawed by his evident dislike for Pound, and his inability or unwillingness to explain what his life amounted to. The Wikipedia entry is a pretty good summary but I’m getting worked up again now so I’m tempted to send in corrections on some small but niggling points. Loved reading your blog. Because, as the old Ez would say, "I am homesick after mine own kind." Thanks! I hope by "own kind" you mean "people who occasionally update their blogs about their unfashionable hobbies", rather than "cryptofascist paranoiacs".